Security Guard Training: What Does It Involve? A security guard plays a significant role in maintaining the safety of citizens in all sorts of environments. Although lacking the same legal authority as the police, security guards still have a responsibility to watch over the people and property they are assigned to safeguard. A career in security is an ideal option for those interested in public safety, emergency management, theft protection, and damage control. One can enter the security industry as a young person just getting started or as an older person transitioning from a previous career. It is not uncommon for police officers to transition from full-time work to eventual retirement by working in the security industry. On the various pages of this website, we break down a security career in fairly good detail. To get started, however, we have put together an overview below. This information will help you understand what it takes to become a security guard and what a security career is like. The National Career Service estimates starting salaries for inexperienced security guards to be between £12,000 and £15,000 annually. An annual salary of £20,000 is not unusual once a guard has some experience under his/her belt. Of course, some security jobs pay significantly more due to the need for advanced training requirements and/or special skills. As far as working environment, security guards cover a broad range of possibilities. For example, a guard may be hired to patrol an industrial complex and monitor the entire premises with the aid of closed-circuit television and other security equipment. Another guard may be hired to supervise the door for a large office building. 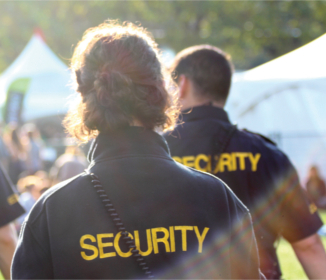 Security guards work in all sorts of environments, including residential buildings, government buildings, airports, hospitals, retail environments, and more. An individual who builds an entire career around security work could experience the full range of possibilities throughout his/her working years. There are no specific educational requirements to be a security guard. However, most employers will require completion of a general education as a bare minimum. New guards with some education in public safety or criminal justice will be given preference over those without such education. Prior military or police experience is also helpful in finding a job. Having said that, there are licencing requirements for most security jobs. Any guard employed by a security agency or contractor is considered to be providing front-line service. As such, a front-line licence from the Security Industry Authority (SIA) is required. You can find detailed information about SIA licencing elsewhere on this website. For now, understand that you must complete approved training in order to earn your licence. You must be at least 18 and able to pass a criminal background check before you can begin training. • a reasonable aptitude for working with electronic security equipment. New security guards do not have to possess all of these skills and personal traits in abundance to be hired. However, an employer needs to see enough to work with through further training and career development. As an example, if you are the kind of person who is easily angered and unable to diffuse tense situations, security work is probably not for you. If you are a polite individual with a combination of self-confidence and consideration for others, you may do very well in security. Please take the time to look into our website in detail if you are interested in a career in security. The information we provide should give you a good starting point for determining whether you want to pursue security as a career. Should you determine to do so, the SIA website will be another valuable resource. A career in security is a rewarding one for the right person. If you have what it takes to be the kind of guard employers are looking for, by all means pursue your desire.